An Ed Wood classic! Follow-up to Ed Wood’s “Plan 9 from Outer Space” about the walking dead, It opens in a cemetery. 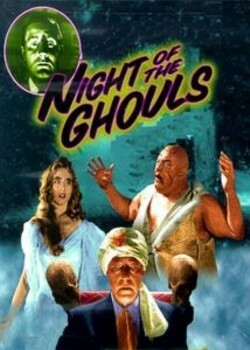 Criswell, the “real” medium, rises from his coffin to tell us of “monsters to be despised.” Dr. Acula (Kenne Duncan) is a phony medium aided by Valda Hansen, a bogus ghost, and big Tor Johnson, wearing rags and horrible scar makeup as Lobo. The doctor swindles people by pretending to contact dead relatives, but then accidentally succeeds in reviving a bunch of corpses that bury him alive! Sat unreleased for 23 years because Wood couldn’t pay the lab bill! Followed by “Sinister Urge” in 1961 (Wood’s last film).